ATA Scientific would like to thank all those that participated in our Oct-Nov 2018 Encouragement Award promotion. The topic of our latest competition focused on the possible existence of a highly advanced extra-terrestrial civilisation observing us on earth and whether they should impose on us a fair and sustainable civilisation or keep well away. While Hollywood might have led us to think that an alien encounter would be greeted with guns and missiles, many of our applicants felt that in reality we humans would act in a far more positive manner. In fact a new study has supported this view and proposed “if we find out we’re not alone, we’ll take the news rather well”. Ultimately the mere fact that we’ve endeavoured to send a record of our presence into space (NASA’s Golden record launched in 1977) shows something about our humanity. Once again, we were delighted to receive so many high quality responses, all of which were deserving winners. Each entry was scored based on originality, relevance and level of entertainment. Three entries were selected to receive our award– first prize at $1500 and 2 runners up at $600 each. Congratulations to our first prize winner, Miss Caroline Holley, second year PhD student at the Institute of Molecular Bioscience, University of Queensland working under the supervision of Associate Professor Kate Schroder. “Being curious about the natural sciences from an early age, it was inevitable that I would eventually end up in research. I became fascinated with how our bodies defend themselves against pathogenic infection and joined A/Prof. Kate Schroder’s lab to develop my knowledge in this area”. Caroline’s project is focused on the inflammasome, which is the major driver of many neuro-inflammatory diseases (e.g. Alzheimer’s and Parkinson’s disease). Research in this area is becoming increasingly important given our aging population and an increase in lifestyle-related disease across the world (such as neurodegeneration, diabetes and persistent pathogenic infections). Current therapeutics for these diseases focus on stabilising the cognitive symptoms, but do not prevent further neuronal damage. The aim of Caroline’s project is to elucidate the role of mitochondria in inflammasome signalling, and use this knowledge to control inflammation in mouse models of neuro-inflammation. Eventually Caroline hopes to apply her research to patients living with chronic inflammatory diseases. In addition to her PhD lab work, Caroline is an active member of her student society’s executive, and has coordinated several career development and social events for her fellow PhD students this year. Caroline plans to use her award to present her research at the Lorne Infection & Immunology Conference in Melbourne (http://www.lorneinfectionimmunity.org) and the ASI Annual Scientific Meeting in Adelaide (http://www.immunology.org.au) next year. “These conferences attract many domestic and international immunology heavyweights, and I’m so excited to broaden my network and collaborations. This will undoubtedly be invaluable for my post-PhD prospects, as I hope to secure a postdoctoral position in Germany after my thesis is accepted”. Congratulations to our runner up, Ms Sabrina Schönborn, international Master student at the Institute of Health and Biomedical Innovation, Queensland University of Technology, working under the supervision of Dr Elena M. De-Juan-Pardo. Sabrina is originally from RWTH Aachen, Germany and currently working at IHBI in the Regenerative Medicine Group as part of her Master Thesis. The team that Sabrina works with is attempting to develop a tissue engineered heart valve replacement using Melt Electrospinning Writing (MEW). In the photo attached Sabrina is standing next to one of the MEW machines in her lab being used to develop the new heart valve. Sabrina’s project is mainly focused on creating a scaffold for a replacement of the aortic root which encloses the aortic valve. Following her graduation, Sabrina would like to continue her career in research and development working with medical products, preferably implants. 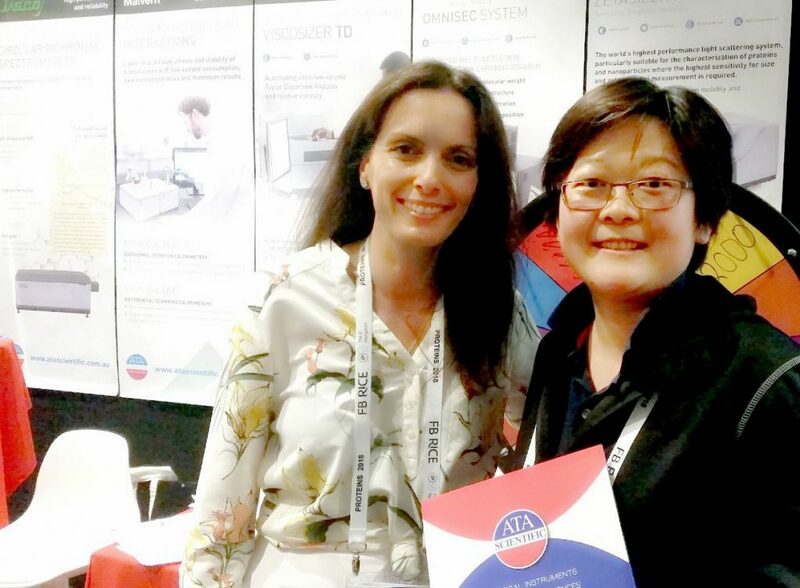 Sabrina plans to use the prize money to attend the Australia-China Conference of Tissue Engineering and Regenerative Medicine (ACCTERM), November 22-24, 2018 being held in Cairns this year. Congratulations to our runner up, Mr Terence Tieu. 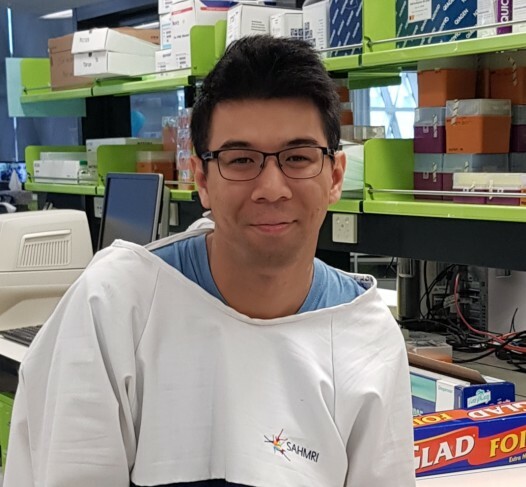 Terence is a joint PhD candidate between Monash University and CSIRO, working under the supervision of Dr Anna Cifuentes-Rius, Dr Helmut Thissen and Prof. Nico Voelcker. His research is focused on the development of Nano carriers, namely, porous silicon nanoparticles for efficient delivery of oligonucleotides. We would like to thank all those that participated. The next Encouragement Award will be posted on our website early 2019. For more information or to stay informed of other upcoming promotions please Follow us on Facebook or contact us. ATA Scientific would like to thank all those that participated in our recent Encouragement Award promotion. The topic of our latest competition focused on the strong link between cognitive behaviour and foods. While studies continue to show evidence that supports the idea that food can influence our thought processes, we asked our readers to consider their own experiences and whether particular foods had any influence on their ability to think and concentrate. Judging by the number of entries received this is certainly a hot topic, particularly for those addicted to coffee and chocolate – yes, you know who you are. Many chose to focus on the science of consuming certain foods and described the chemical pathways leading to changes in brain function. Others noted the social impact and the role food plays in the expression of cultural identity. We were delighted to receive so many high quality responses, all of which were deserving winners. Each entry was scored based on originality, relevance and level of entertainment. After much deliberation, three entries were selected to receive our award– first prize at $1500 and 2 runners up at $600 each. 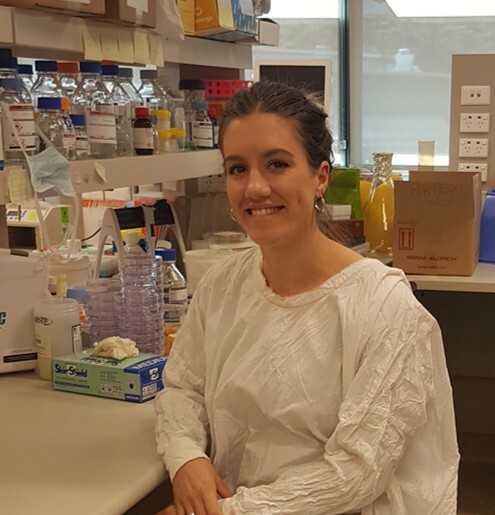 Congratulations to our first prize winner Samantha Wade, PhD candidate at the Targeted Cancer Therapeutics Laboratory, Illawarra Health and Medical Research Institute, University Of Wollongong, working under the supervision of Dr Kara L. Vine-Perrow. Samantha is a third year PhD student working on implantable drug delivery for pancreatic cancer. Her work involves re-purposing FDA approved materials and clinically used drugs to make dual drug eluting structures for implantation and local release in pancreatic tumours. Samantha works with a team of clinicians, material engineers and biologists to cover all aspects of the project, to fabricate implants that are targeted toward clinical use. For Pancreatic cancer, systemic chemotherapy has been found to be largely ineffective and surgery is not an option for many people because most cases are diagnosed after the cancer has spread to other parts of the body. Samantha’s work on drug-loaded implants may offer patients a better chance of survival as they can be placed directly into the tumour to shrink it down to a size that can be surgically removed. Samantha plans to use the award money to help cover the costs of attending the controlled release society annual meeting in Spain next year. Congratulations to our runner up, Cameron McKnight. Cameron McKnight is a PhD student based at the Murdoch Children’s Research Institute (MCRI) in the lab of Prof. David Thorburn. His degree is through paediatrics at the University of Melbourne and he is supported by a Melbourne Research Scholarship. Cameron is also President of the Melbourne Children’s Campus Research Student Association and works with a group of volunteer students to organise networking and educational opportunities for all students studying on the children’s campus. Working with his supervisor Ann Frazier, Cameron’s research focuses on childhood forms of mitochondrial disease, a group of complex inherited genetic disorders that primarily affect cellular energy production. He is developing pluripotent stem cell models to facilitate preclinical treatment studies and investigation of the underlying cellular mechanisms of disease. Although mitochondrial disease affects approximately 1 in 5000 live births, there is currently no known cures or treatments, a result of the clinical and genetic heterogeneity of the disorders. Still, a number of agents show therapeutic promise. The ultimate goal of Cameron’s project is to identify a potential treatment option using the clinically affected cell types by generating them in culture from his pluripotent stem cell models. “This award will allow me to present my research at two discipline specific conferences this year, Australian Functional Genomics Conference in September and AussieMit in November, providing me the opportunity to get some valuable input from experts in fields. These conferences are also a great chance to network and potentially foster collaborations that could take my project to the next level! Post PhD, I hope to find a postdoctoral fellowship in stem cell or mitochondrial research. Having already moved from Canada I hope to be able to remain in Melbourne, but I am open to moving across the globe again short-term in order to develop some important long-term connections”. 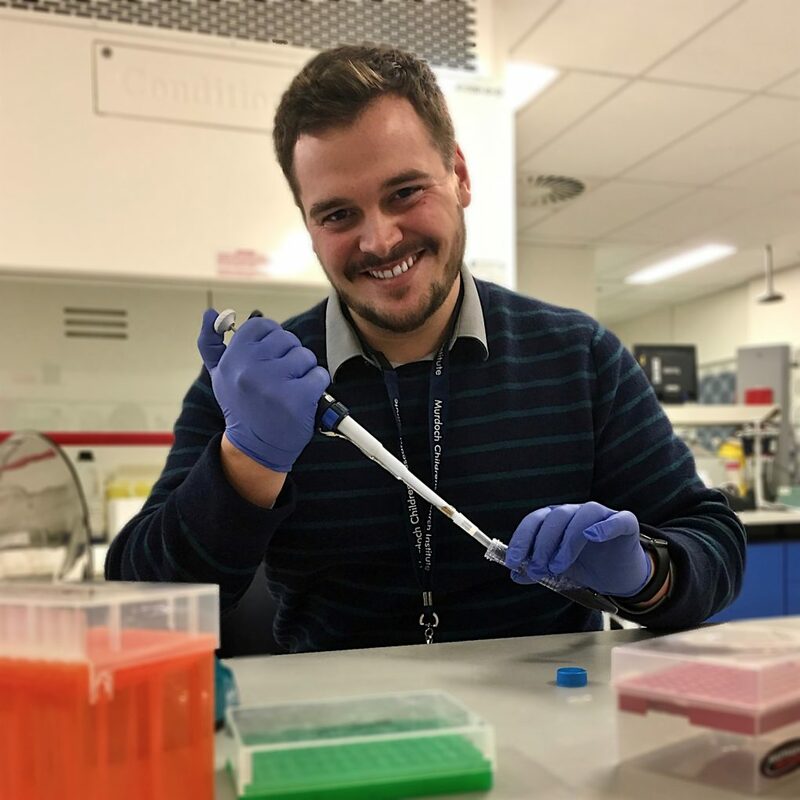 Congratulations to our runner up, Dr Michal Bartnikowski, a Postdoctoral Research Fellow from the School of Dentistry, at The University of Queensland. Michal is currently working with supervisor Professor Sašo Ivanovski on the development of 3D printed scaffolds for bone and periodontal regeneration. Michal’s work focuses on the development and clinical translation of custom biodegradable tissue engineered scaffold implants for bone regeneration of orofacial defects. These implants are made to fit individual patient’s geometries, and form a supportive structure to help the growth and development of bony tissue. 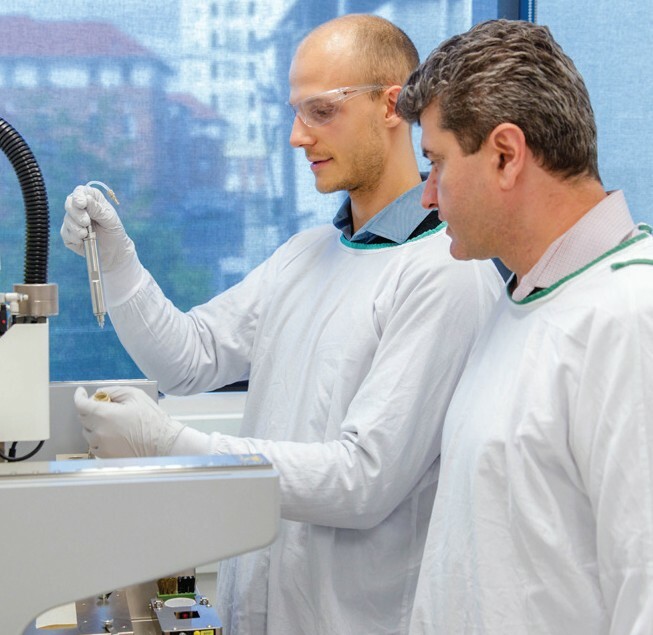 Over the next few years, Michal aims to take a suite of tissue engineering products to the market, delivering affordable custom tissue regeneration solutions to patients in Australia. Michal will use this award to help fund his trip to Kyoto, Japan this year, where he will present some of his work at the Tissue Engineering and Regenerative Medicine International Society (TERMIS) World Congress 2018 conference. We would like to thank all those that participated. The final Encouragement Award for 2018 will be posted on our website soon. For more information or to stay informed of other upcoming promotions please ‘Like us” on Facebook or contact us. ATA Scientific would like to thank all those that participated in our April 2018 Encouragement Award promotion. The topic of our latest competition focused on the future of scientific conferences and secondments and whether they are still needed with access to publications and information now fast and cheap over the internet. While presenting at scientific conferences can be an enjoyable and rewarding experience, the question invited readers to consider whether the money spent on these events could be better used on underfunded projects. The dilemma of attending scientific conferences or not can be intensified with the prospect of travelling to exotic locations or meeting famous Nobel Laureates. Overall, it came to no surprise that the social aspect and collaborative, scientific interaction that results from attending these events resonated with many for their support. We were pleased to receive such a diverse range of high quality responses, all of which were deserving winners. Each entry was scored based on originality, relevance and level of entertainment. Congratulations to our first prize winner Gabrielle McClymont, Masters student at the School of Life and Environmental Sciences, University of Sydney and works under the supervision of Professor Jacqui Matthews. Gabrielle is researching novel α-helical peptide inhibitors of breast cancer oncogene LMO4. She has been working to redesign the peptide protein interface of LMO4 by replacing the traditional β-strand binding partners with novel inhibitory α-helical ones and designing a high throughput screening mechanism to identify these peptides. Inhibitors of LMO4 are a method to understand LMO4 mediated tumour progression and possible therapeutic precursors. 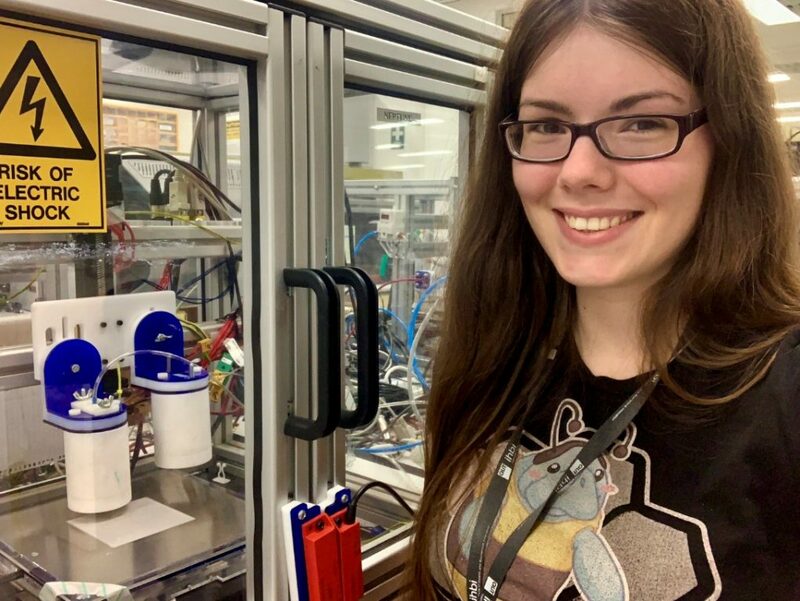 Gabrielle has recently won the Gates Cambridge Scholarship to undertake her PhD in Biochemistry at Cambridge University. Her PhD with Professor Nick Gay will elucidate the molecular mechanisms of inflammatory signal transduction in the innate immune system. Focusing on understanding the structure, function, kinetics and stoichiometry of TLR4 mediated inflammation with has been implicated in viral haemorrhagic fevers (end stage of disease such as Ebola and Dengue) and Sepsis. This research will provide the crucial molecular structure from which new therapeutics targeting severe inflammation can be developed. “My life aim is to improve humanity through scientific endeavour. At the age of 11, I met Dr Takyama an eminent HIV researcher who inspired me to develop my scientific curiosity; years later volunteering at St Vincent de Paul, I observed my small services improve lives. This motivated my desire to use scientific research to magnify my contribution and advance the welfare of humanity. I will achieve this through my two interests, science and policy; utilising medical research and implementation in public policy with industrial collaboration to maximise the benefits globally”. Gabrielle graduated from the University of Sydney Bachelor Advanced Science Arts, 1st class honours, Biochemistry, Government & International Relations. 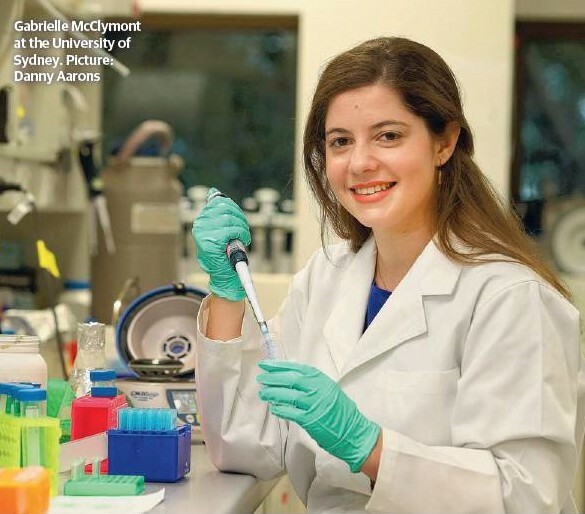 She is a finalist at the World, Asia-Pacific, Australasian Women’s and Australian University Debating Championships and Vice-President of the Politics Society and Society for Molecular Biologists. Gabrielle plans to use the award money to help cover the costs of undertaking her PhD at Cambridge and in particular to attend conferences in Europe. 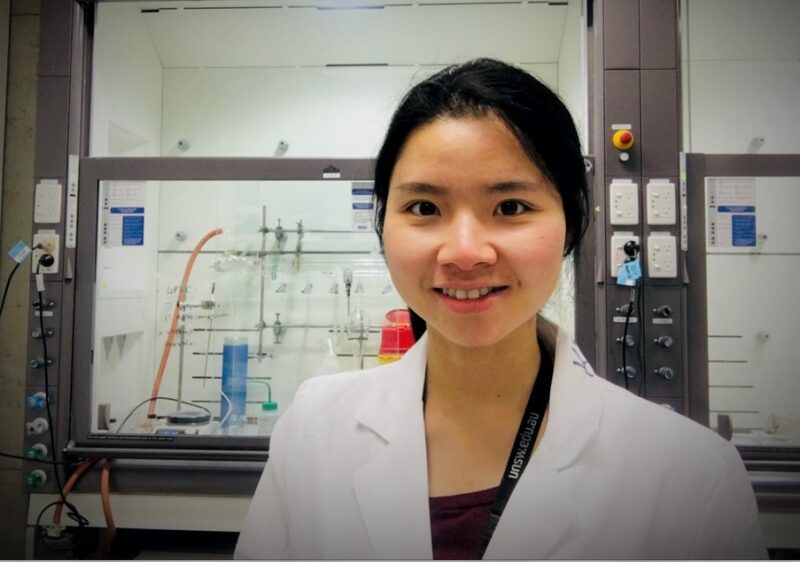 Congratulations to our runner up, Kristel Cahyadi Tjandra, third year PhD Candidate at CBNS: ARC Centre of Excellence in Convergent Bio-Nano Science and Technology, University of New South Wales under the supervision of A/Prof. Pall Thordarson. Given the interdisciplinary nature of her project, Kristel works with two diverse teams from the School of Chemistry (Thordarson Group) and Children’s Cancer Institute. Kristel’s research is focused on the study of peptide-based drug delivery systems for targeted cancer treatment. Peptides are short chains of amino acids, often a part of a protein unit that has particular function inside the body. 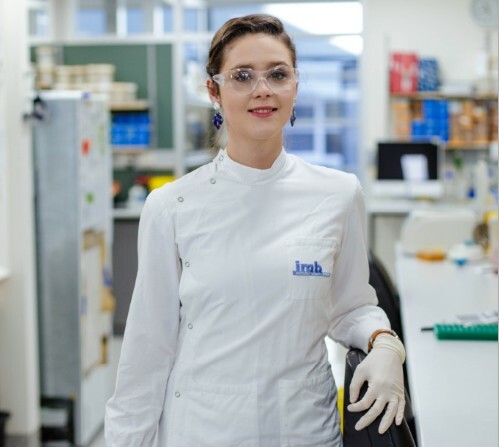 Her research objective is to design, synthesise and investigate the pharmacokinetics of peptide-based drug delivery systems, including the way they are taken up and react in the body, in order to develop drug-delivery systems that could target cancer cells in a specific manner. Kristel plans to use her prize money to travel and attend the European Molecular Biology Lab (EMBL) Chemical Biology Workshop 2018 in Heidelberg, Germany, 29 Aug – 1 Sep 2018. “The award, which will contribute towards my attendance at EMBL Chemical Biology Workshop 2018, will give me the opportunity to engage with researchers working in the interface between Chemistry and Biology with a wide range of expertise. The opportunity to learn from other experts will hopefully spur new ideas and facilitate future collaborations”. Kristel’s career goal is to work in the pharmaceutical industry and to keep pursuing her passion in the area of drug discovery and development. “I think that this area of pharmaceutical science will continue to have a huge impact in the society and that the technology we now have could help advance the field immensely”. Congratulations to our runner up, Amy Wilson, from the Hudson Institute of Medical Research, Centre for Cancer Research, in Clayton, Victoria. 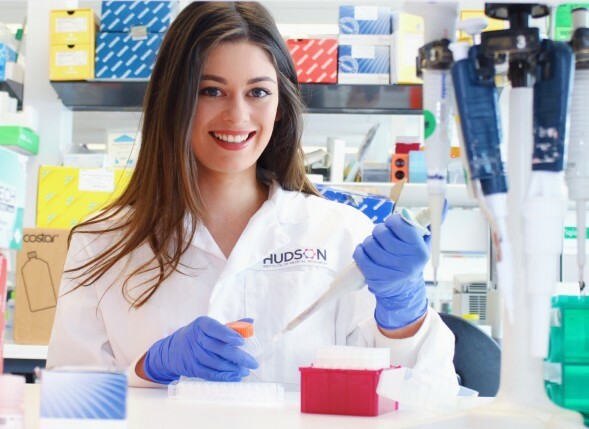 Amy is a third year PhD Student in the Ovarian Cancer Biomarkers laboratory at the Hudson Institute of Medical Research, under joint supervision of Dr. Andrew Stephens and Prof. Magdalena Plebanksi. 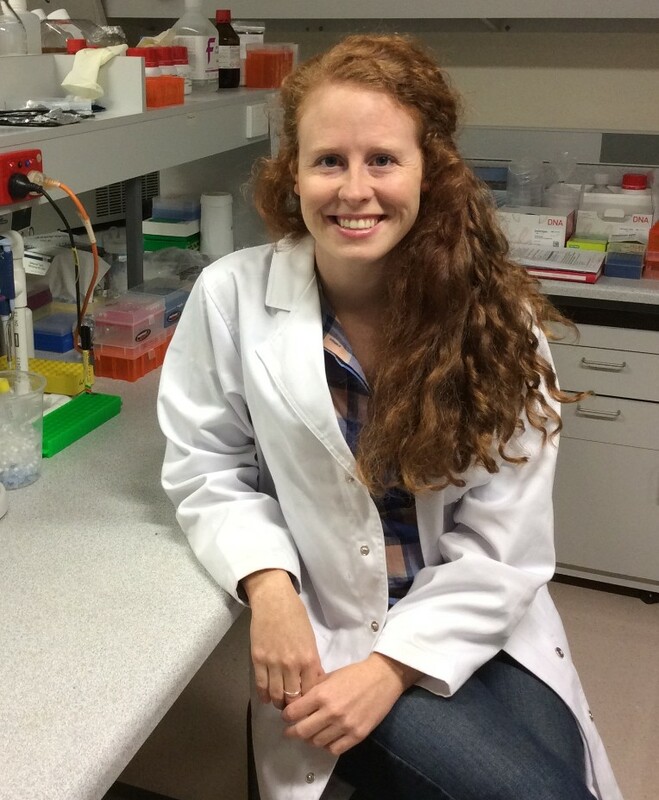 Amy’s PhD research is focused on re-activating the immune system to more effectively treat ovarian cancers. Often, ovarian tumours are hidden from the immune system via secretion of certain proteins, and this can lead to chemo-resistance. Amy’s research involves the re-purposing of an already clinically approved drug in combination with current therapies in order to reinvigorate the anti-tumour immune response. Amy plans to use the award to attend the Australasian Society for Biochemistry and Molecular Biology ComBio 2018 conference being held in Sydney from 23-26 September 2018. “This award will allow me to present my research to leading scientists to gain valuable feedback, and to establish a strong scientific network with esteemed researchers from various fields. After my PhD, my goal is work somewhere internationally; where I can learn, share my knowledge and skills, and form collaborations”. We would like to thank all those that participated. The next Encouragement Award will be posted on our website in May 2018. Our annual ‘SPIN TO WIN” Young Scientist award was once again a very exciting event during the 43rd Lorne Protein Structure and Function conference (4-8 Feb 2018). Students and academic staff were invited to spin the ATA wheel to win a number of different prizes which included the main prize on the board – our $2000 Young Scientist Award. A number of participants progressed through to the final round which saw the exhibition hall light up with great energy and excitement. The audience followed in anticipation until finally the winner was announced! Congratulations to Dr Naomi Ling, Senior Researcher at St Vincent’s Institute Medical Research – winner of the $2000 Travel Award ‘Spin to Win’ Prize! Naomi kindly nominated Toby Dite as the recipient of the award as per the conditions. The ATA Scientific young scientist award is open to PhD candidates and scientists aged 30 years or younger. By setting an age limit we give early career scientists access to financial assistance to enable them to collaborate with peers at scientific meetings such as the Lorne Proteins conference, and to launch their careers within their field of study. 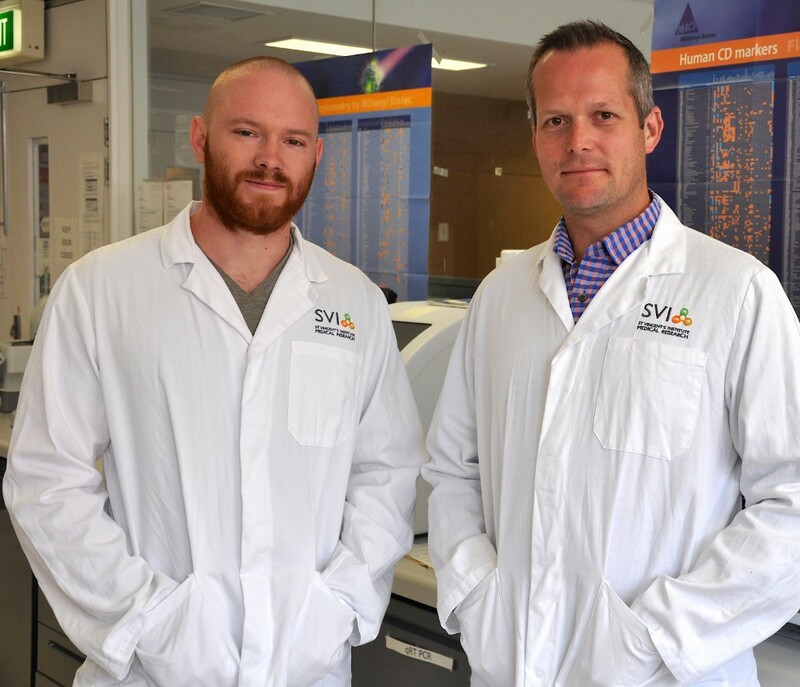 Toby is in the final stages of his PhD project, with supervisors Dr. Jon Oakhill and Prof. Bruce Kemp at St Vincent’s Institute of Medical Research, through the University of Melbourne. Toby is investigating post-translational modifications of the energy sensing kinase AMP-Activated Protein Kinase (AMPK), and how this relates to drug activation/inhibition of AMPK pathways. This involves the feedback of several pathways on AMPK, leading to phosphorylation of critical residues involved in drug sensitivity. 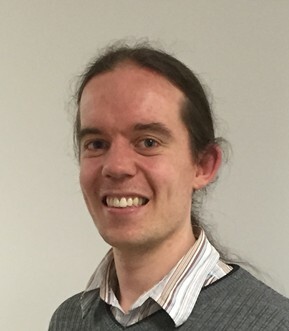 To delineate direct and indirect drug activation of AMPK, Toby’s research utilises mass spectrometric analysis of metabolites alongside other methods such as western blotting. Toby’s thesis involves the identification of new pathways involved in AMPK regulation, and the development of new methods of measuring AMPK activation/inhibition. Toby hopes to stay in the field of biochemistry, specifically investigating kinase signalling pathways into the future. Toby would like to use his award to attend the AMPK conference, from mechanisms to new therapies, 30 September to 4 October this year, in Canada. The SPIN to WIN award is part of the ATA Scientific Encouragement award program that started in 2011. The intent is to provide scientists access to financial assistance to enable them to collaborate with peers at scientific meetings and to launch their careers within their field of study. The awards are run at least four times a year which has so far awarded 53 winners from multiple Universities and research organisations around Australia and New Zealand. We plan to continue posting these awards into the future and encourage all students to enter. For all previous winners please visit our website here. ATA Scientific would like to thank all those that participated in our November 2017 Encouragement Award promotion. The topic of our latest competition was focused the science of de-extinction, the concept that we can bring back to life species that have gone extinct through cloning and genetic manipulation. The question examined the potential benefits and dangers raised by the reintroduction of extinct species. Those who favoured de-extinction chose to focus their entry on the effects of recent human activity and climate change as a moral reason to support the process. Several discussed the possibility of reconstructing and testing extinct genes for novel properties in the pursuit of developing new drugs for presently incurable diseases. Reanimation was also suggested as a way of helping currently endangered species by restoring lost genetic diversity. Aside from these and other obvious benefits, the potential dangers seemed to overwhelm many particularly those familiar with the vivid dinosaur scenes showcased in the movie “Jurassic Park”. 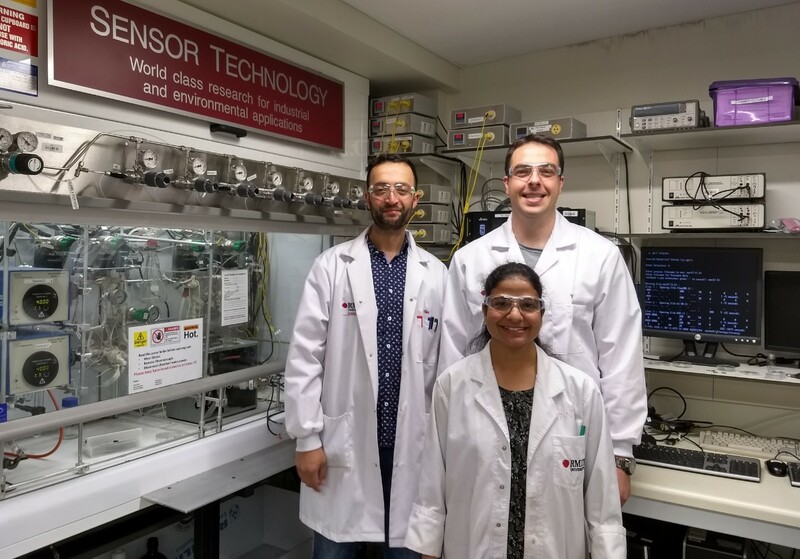 Congratulations to our first prize winner, Shravanti Joshi, a final year PhD student at the Centre for Advanced Materials and Industrial Chemistry (CAMIC), RMIT University. Shravanti works under the supervision of Dr Samuel J Ippolito, and Dr Ylias Sabri, School of Science at RMIT University. Back Left: Dr Ylias Sabri, Back right: Dr Samuel Ippolito, Front: Dr Shravanti Joshi, CAMIC, School of Science, RMIT University, Melbourne, Australia. Shravanti has recently completed her doctoral work at the Mercury Laboratory, CAMIC. Her research primarily dealt with synthesis of defect engineered hierarchical nanomaterials for ultra-sensitive and selective CO2 detection. From the environmental monitoring perspective, selective CO2 detection is imperative as it is widely recognised as an occupational hazard, toxic contaminant and strong asphyxiant. However, its accurate monitoring still remains a formidable task owing to its chemically inert nature. During her PhD candidature, Shravanti demonstrated a high level of achievement with 6 peer-reviewed first author articles in respected journals such as Journal of Materials Chemistry A, ACS Applied Materials & Interfaces etc. “It’s definitely motivating to receive such encouragement award for which I’m grateful to ATA Scientific Instruments for extending strong support”. Shravanti plans to use the award money to attend the International Conference on Nanoscience and Nanotechnology (ICONN 2018), being held from 29 Jan-2 Feb at the University of Wollongong. Shravanti plans to present an invited lecture entitled “Prolated BaTiO3 spheroids decorated with Ag@CaO as Reliable CO2 Gas Sensitive Layer”. “ICONN 2018 will be a perfect international platform for an early career researcher like me to showcase achievements in the field of chemical sensing to my peers and collaborators around the world. This journey from a novice mechanical engineer to a confident material scientist further motivates me to continue with germane work that will produce invaluable insights on how to use smart nanomaterials innovatively for competitive lab-on chip technologies in the field of environmental remediation and subsequent challenges for practical applications”. 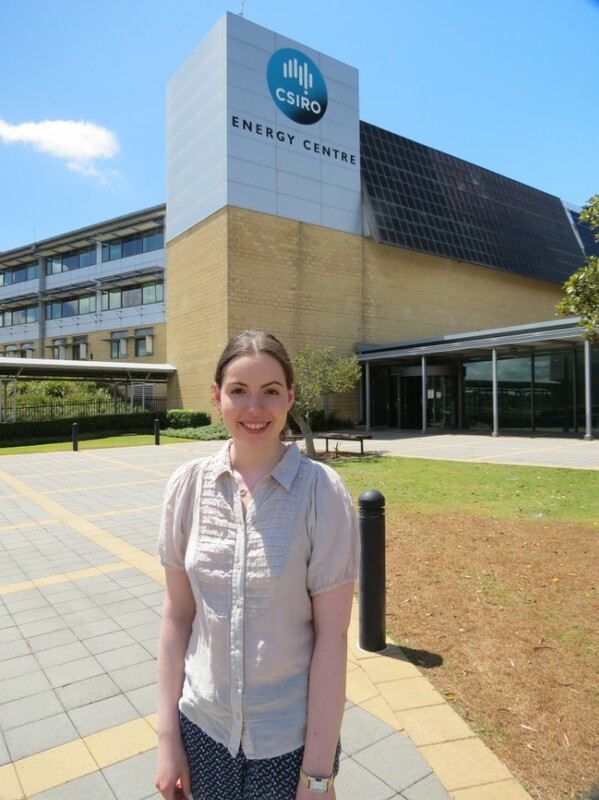 Congratulations to our runner up, Larissa Fedunik, second year Chemistry PhD student at the University of Newcastle under the supervision of Professor Scott Donne and Dr Alicia Bayon at CSIRO Energy. Larissa’s PhD research is focused on thermochemical energy storage (TCES) for solar thermal applications. TCES has excellent potential because of its high energy storage density and the fact that it uses inexpensive materials such as calcium carbonate (limestone). Larissa is working on the synthesis and laboratory-scale demonstration of enhanced materials to increase efficiency and cyclability. “I plan to use the award to attend a chemistry conference with a strong focus on renewable energy technologies or even the Public Communication of Science and Technology (PCST) Conference. I think communication between scientists, government and industry is essential”. Congratulations to our runner up, Stephen Bernard Drane, from Monash Institute of Pharmaceutical Sciences studying under the supervision of Professor Raymond Norton. Stephen is currently in the final throes of completing his Masters thesis, detailing work undertaken to evaluate peptide toxins from animal venom for possible therapeutic applications. “My true goal is to combine my love for science with my equally ardent love for performance, and forge a career making science interesting and accessible for society at large”. Stephen plans to use the award to attend the Public Communication of Science and Technology 2018 conference, to be held in Dunedin NZ in April. This is an international science communication conference, where Stephen plans to network with people in the industry and learn the most effective strategies for getting the wider public engaged with the ongoing endeavour of scientific discovery. We would like to thank all those that participated. The next Encouragement Award will be posted on our website in 2018. ATA Scientific would like to thank all those that participated in our August 2017 Encouragement Award promotion. The topic of our latest competition was focused on Malware such as Petya and WannaCry and ways we can protect our computer systems by taking lessons from the way nature deals with threats. To our delight, we received a large number of entries which was eventually whittled down to just 9 finalists. Each was scored based on originality, relevance and level of entertainment. Three entries were selected to receive our award– first prize at $1500 and 2 runners up at $600 each. Congratulations to our first prize winner, Samuel Pinches, is a third year PhD student in the department of Chemical and Biomolecular Engineering at the University of Melbourne, in the Ceramics and Minerals Processing Group with Professor George Franks. “I have a real passion for learning how things are made, and I have found a keen interest in understanding the relationship between the unique properties of a material, the processes that can shape and change the material, and the applications that this combination can enable”. Samuel’s research is focused on examining a new process to potentially enable the production of complex shaped ceramics, more efficiently. The group is examining a modified freeze-casting process in order to produce dense near-net shaped ceramic parts. The goal of this new process is to reduce the time and cost per part, in order to improve the feasibility of mass producing complex-shaped ceramic parts. 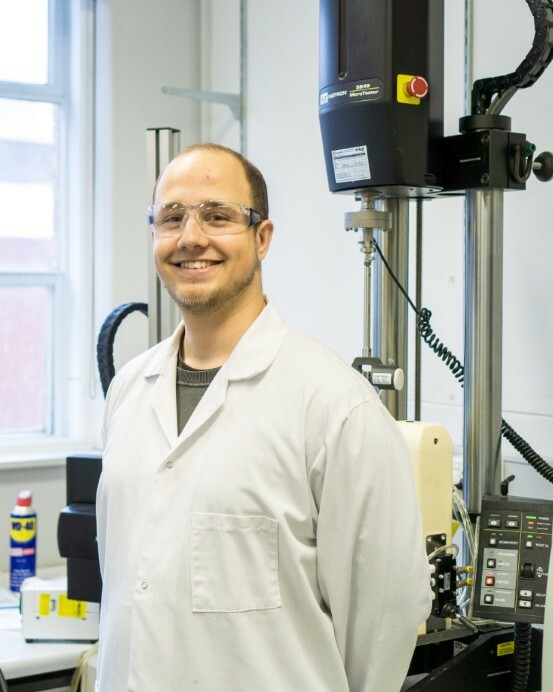 Previous work has identified that this process produces parts with major flaws, so Samuel’s work has focused on studying each step of the process, in order to develop a clearer understanding of what is occurring, and to identify the cause of defects observed in samples. By working to apply the knowledge that is gained, the group can minimise the flaws and optimise the product quality, as well as identify any limitations that remain for using this process in real world applications. Having studied chemical engineering, Samuel’s goal is to continue finding engineering opportunities for solving multidisciplinary problems, such as the challenges associated with taking novel materials and processes out of the lab, and bringing them into real-world applications. Photo of the Neurogenetics/Bioinformatics Lab at the University of Adelaide. Prof Jozef Gecz is in the pink shirt and Atma is next to Jozef in the black and white shirt. Congratulations to our runner up, Atma Maria Ivancevic, a Postdoctoral Researcher at The University of Adelaide, Robinson Research Institute, Adelaide Medical School, Neurogenetics. Atma works under the supervision of Professor Jozef Gecz, at The University of Adelaide. Atma’s current project is focused on investigating structural variations in the human genome (e.g. deletions, duplications, mobile element insertions) and understanding their role in neurological disorders such as epilepsy and cerebral palsy. Using whole genome sequencing data and massively parallel computing infrastructure, Atma’s work is focused on design and optimizing pipelines to identify pathogenic variants. Ultimately, this will help to define the diverse spectrum of genomic rearrangements that contributes to disease risk in the human population. “As an early career researcher, one of the biggest challenges is getting noticed at an international level in the scientific community”. Atma plans to use her award to attend a prestigious international conference (e.g. 2018 Human Genome Meeting in Japan) that will allow her to network with the best genomics labs in the world. This is particularly important considering Atma’s immediate career plans are to move overseas for a postdoc next year in 2018. Congratulations to our runner up, Dr Kendall Corbin, Post Doctoral Research Fellow in the College of Medicine and Public Health at Flinders University, South Australia. Kendall works in the Medical Biotechnology Department headed by Professor Chris Franco. Her research focuses on finding novel and innovative ways to utilize agro-industrial waste and low-value marine resources for biofuel or medical applications. Interest in capitalising on these underutilised resources is attributed to the unique biological properties of extractable carbohydrates and bioactive compounds. Furthermore, the use of these residues is considered to be more socially and environmentally responsible than using edible portions of food crops. One limitation that currently undermines the practicality of using waste biomass sources is the complexity of the material (more specifically the plant cell wall). Plant-based bioresources consists of a heterogeneous matrix of carbohydrates, polyphenol polymers and proteins that are difficult to separate into discrete, usable components without using toxic chemicals or high-energy inputs. To circumvent these limitations my research explores the potential to incorporate green chemistry approaches as a sustainable alternative for biomass processing. Kendall hopes that this innovative multi-facet approach will set the scene for further advancements in the field and ultimately our ability to convert trash (agricultural waste) into treasure (high-value products). Kendall plans to use this award to attend one of the workshops/conferences organised by the European Molecular Biology Laboratory (EMBL). One of the key conferences of interest is Microfluidics 2018: New Technologies and Applications in Biology, Biochemistry and Single-Cell Analysis (Heidelberg, Germany). We would like to thank all those that participated. The next Encouragement Award will be posted on our website soon.